Will this terminate your need for a three-way floorstander? "Come with me if you want decent sound on a budget!" Teufel is by far the best-known exponent of direct-sell loudspeakers and has been steadily raising its profile in the UK over the last couple of years with great models such as its Columa 900 5.1 surround sound speaker system and Ultima 800. The big difference between Teufel and other brands is that it's not available from hi-fi dealers, cutting out the middleman, which means lower selling prices. So, to an extent, you have to take its qualities on trust. But you do get a generous eight-week trial period, during which the speakers can be returned for a refund if you find you can't get along with them. An additional confidence builder is the astonishing 12-year guarantee period. Yes, that's right, 12 years! The T500 is one of the latest from Teufel, a classic three-way floorstander, which, thanks to its distribution model, sells for a very attractive price. This pitches Teufel into direct competition with some of the more popular mainstream brands, including Monitor Audio and Wharfedale. Although essentially conventional in design, there are some noteworthy features, which are not quite by the numbers. The drive unit complement includes a 28mm fabric-dome tweeter, two 170mm bass drivers and a similar size midrange unit, the size chosen to provide the compact footprint and svelte lines that ensures the speaker will not be intrusive in most rooms. The bass drivers use Kevlar mesh diaphragms, with long-throw suspensions, while the midrange unit has a sandwich pulp cone. Bi-wiring or (even) bi-amping are both supported. Finally, the tall, slender reflex-loaded enclosure is fitted with a cleverly integrated platform base. A lot of effort has gone into optimising dispersion and minimising phase error, as well as improving time alignment at the point where the tweeter takes over the reins, which is the reason for the stepped-baffle and the deeply recessed tweeter dome. But even leaving this to one side, the T500 is impressively constructed, the sturdy woodwork being made from 18mm MDF with a dark vinyl-wrap wood-effect finish. The price doesn't allow for a real wood finish. 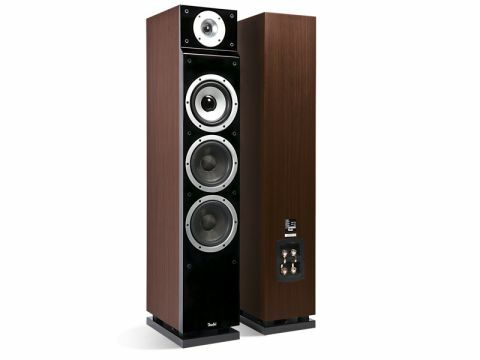 More impressive than build quality is the T500's high-value rating, which is largely attributable to the fact that the speakers are sold direct to the end user. The T500 is ready to accept spikes or isolation pads. These don't come in the box as standard, but isolation pads are available optionally, costing around £25 for a set, and you can get spikes from various third-party sources. Don't economise on this: the tall, narrow form factor places stability at a premium. This is a high-value package, with a grown up performance, but – and inevitably there is a but – there's more quantity here than quality. The T500 is well made and presented, and the bass is moderately deep and powerful, but it is also uneven. The polar response from the tweeter is odd: you need to line up fairly accurately with the tweeter's main axis to achieve a smooth, well-extended response, and something similar happens in the low and middle frequency range too. In this case, the effect has little to do with the listening axis, but the bass and mid-band are similarly uneven, a little wooden and lumpy if you will. If this sounds like damming criticism, it must be seen in the context of value. There's no questioning that the Teufel offers good value for money, and with some care over details such as spikes, as well as room positioning, you can achieve a good working balance. There's no denying that you get a real bang for your buck here, and the ability to audition the speakers in your home for a long period. But we never felt completely comfortable with this speaker, which seems to have been designed more by the numbers, rather than real inspiration. There's nothing objectionable about the sound, but it is more workmanlike than inspired. Of course, if funds are limited, there are bound to be trade-offs, but from the audiophile perspective we would gladly sacrifice a little of the bass extension for greater overall refinement.